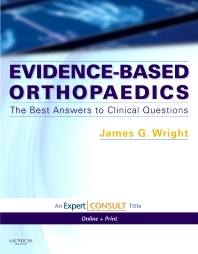 Dr. James Wright, Associate Editor for the Journal of Bone and Joint Surgery, presents this landmark publication and novel approach to orthopaedic problems and solutions. This new, evidence-based reference examines clinical options and discusses relevant research evidence to provide you with expert recommendations for best practice. The consistent chapter format and featured summary tables provide “at-a-glance” access to the evidence-based literature and clinical options. Leading authorities contribute their expertise so you can apply the most effective clinical solutions to the persistent questions you encounter in your practice. You can even access the fully searchable and regularly updated text online! The result is an outstanding resource in clinical orthopaedics, as well as a valuable framework for translating evidence into practice.